EASY TO USE: Use approximately 4 ft. of decoy line and let it rip! 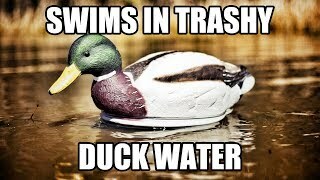 Trashy Duck Water? No problem! Finally, there is a Swimmer on the market that will swim in trashy Duck Water…..the MOJO Swimmer has two small jet pumps mounted inside a special molded base that intakes water right under the water surface to prevent trash from clogging up the pumps. It runs on a 6-volt rechargeable MOJO battery (included) and has a built in MOJO cycler set for 4 seconds ON and 10 seconds OFF. The battery set flush inside the molded base to balance the body to give it the “V” like wake a real duck makes when swimming. Not over bearing, but REAL motion in your spread. Attach approximately decoy line with a swivel (not included), and let it rip. Runs 6 to 8 hours on a fully charged battery. Decoy adds Excellent Movement and Realism! This decoy adds excellent movement and realism to your spread, especially when there is little to no wind. I own ALOT of Mojo products, this could be my all time favorite.